It is with heavy heart that I tell you that my darling Willow, my Willowmina, has passed away. She was 4 years old and a stunning Akbash. 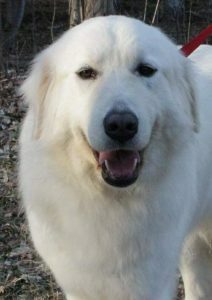 Akbash are a breed of Livestock Guardian Dogs (LGD) from Turkey. Willow guarded her goats and was always in the middle of a pile of them. I said good night to her and told her to guard mama’s goaties around 11 pm on August 16th. By the time I went back out about 14 hours later, she was dead. We appeared to have had a predator attack during the night. Willow was fluffy and lovely clean white when I last saw her but when I found her in the barn she was covered in dirt and filthy. She had been in a hell of a fight thrashing around in the dirt. We had about 1 inch of rain in the wee hours of that morning and she was completely dry so I know that it happened between 11 pm and about 2 am before the rain started. Her guarding partner, Rachel, was injured. 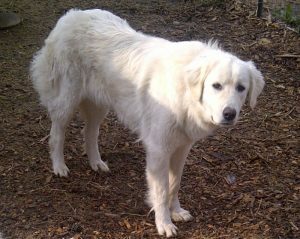 Rachel is a 2.5 year old Anatolian female. Anatolian is another breed of Livestock Guardian dog from Turkey as well. Ike was in the pen next to the girls with about 5 goats and the girls were guarding my milkers and a few kids, about 14 does in total in the other pen. 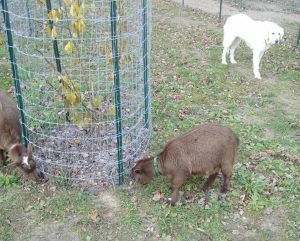 We did not have a scratch on any of the goats. All were accounted for and on all four legs still. Willow died protecting her goats. That is a Livestock Guardian dogs job but to be honest I didn’t ever think we would have it happen. I always thought their presence and barking would be enough to deter predators. We had 9 LGD that we had combined in with the goats and retired into the house. However the giant breeds have a shorter lifespan and we lost 6 of them last year. 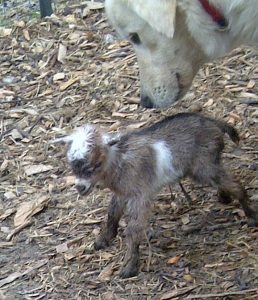 I did not replace any of those dogs, so we were down to 3 Livestock Guardian dogs out in the pens with the goats and none in the house with us. That lower number has made their collective “voice” quieter and smaller. We had noticed that the coyotes and other predators have been coming much closer in the woods this last year since the passing of our main guard and his brother, both of which were 10.5 year old. There was no broken fences, no holes in the fences, no holes dug under the fences in or out, none of the gates disturbed, no chains or locks moved, no fur on the fencing anywhere. No evidence of anything wrong except my dead Willow and the corner of the tarp that had been attached to the top corner of the barn had been torn down. There was no blood. No fur except Willows everywhere but I didn’t think that odd at first as she was blowing her coat. There had been so much rain there was also no tracks. I took Willow to the vet and had a simple autopsy performed. The left side of her body was covered in canine puncture wounds like she had been in a fight with another canine which I think was one or two coyotes or wolves. The Right side of her body seemed OK except for a hole tear in her hip. Well it seemed small but once the vet moved all the hair aside, she was able to see it was much worse. And there was a tear in her shoulder on that side as well that I missed entirely with all her fur. Both locations had the muscles torn to shreds and the vet used words like “hamburger” and “eviscerated” and a “vicious attack”. All of that was not visible to the eye on the outside as all that damage was under the fur and skin and inside. This attack had fractured her shoulder but it had not broken her hip. The vet said that this trauma of those injuries on the Right side was what killed her. The injuries on one side of her body did not match what I saw on the other side of her body which is why I think it was two different types of predators. I think a coyote or two got in and got into a fight with her and Rachel. (Rachel’s injuries were all puncture wounds on her face and head and all swollen up and got infected. She did not have any wounds visible anywhere else but walked as if she has been battered and had sore muscles everywhere on her body.) They were scared away by a cougar. I think the cougar was drawn in by the smell of the blood and it could hot foot jump up onto the roof of the barn as the ground is high behind the barn and there were a few stumps there that gave a leg up. It was a simple walk across the roofs of the barns to the one in the pen, and in the dark the blue tarp might have seemed like another roof which is why the corner was torn down if the cougar tried to jump on it. I think the cougar either hit her and slammed her on the barn or bit down on her, either way it would have taken more force to fracture a shoulder of a 90 lb Akbash fighting for her life than a 30-50 coyote or 20-30 bobcat could have managed. I know that bears can do damage but they are inherently lazy when it comes to livestock attacks and attacking a pen with two livestock guards in it as well as having to swat down 5 foot fences would have been more work than it would have cared to exert. Never mind the fact that bears are NOT graceful and would have done some damage to the fence as they would have torn it down and not bothered to enter the pen any other way. That doesn’t really leave much else. 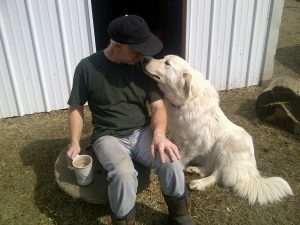 I know that a Livestock Guardian Dog’s job is to protect their stock with their lives if necessary. But if you want my honest opinion, I would have given half the goat herd for Willow to be back with me. Willow is family. The goats are stock. I begrudged every day she was in the barn yard guarding goats and not in the house guarding me. She was my baby and I miss her terribly. I am devastated to think her final time was so filled with pain and terror and that we have lost her so violently and so young. I did call the DNR, which told me that there are no cougars in the state of MI. ~BULL! !~ Our neighbors have been watching a pair with two kits all summer. Others have photos of them. Our woods and his woods back up on each other. Cougars have a 100 mile range of territory. He isn’t even half a mile from me. The cougar has been spotted south of Shelby, MI which is about 5 miles from us. I told the DNR he didn’t know what was under his nose. He tells me they are protected. Hmmmmm…why is something that does not exist protected? Like I said before ~BULL~. If I ever see the cougar, it or I will not survive the encounter. I follow the rule that the old Colorado mountain man told me….if you SEE a cougar, it is TOO LATE!! They only show themselves when they are going to attack you. I have seen two cougars in the wild in my entire life. One in the mountains of Colorado at 10 am bright and sunshine day when I almost ran it over at the end of my driveway. I think we were both stunned to see each other that morning. And my other encounter was when one darted across the road and I almost ran over it one dark stormy night when I was out driving the back roads in Scotland. I have heard cougars late at night when I was outside with the stock on my Colorado Ranch in the mountains…..it had a fresh kill and the screams were some of the most horrifying sounds I have ever heard in my life. I have no desire to repeat any of that. Rest in Peace, my Willow. Melisa & Charlie, words can not express how truely sorry I am for your loss. They are family. We can only hope she went quickly . I am so sorry for the loss of Willow. She was such a sweet and loving guard dog. I know that all of your dogs are your babies as mine are to me. Again, I am so sorry for the loss of your beloved Willow. Oh, no! Willow was such a sweet, sweet dog! The last time we talked you were worried about Rachel but no chance of that? So, so sorry for your loss, Mellissa and Charlie. ?